Upon walking into John Von Bergen’s sculpture class for the first time, an immediate, and almost palpable vibration can be felt. Students are busy working, organizing, building, molding, even their research carries an air of urgent excitement. I was looking forward to my visit to the sculpture class. One visit turned to three, as I became increasingly enamored with the sculpture class, and the busy, productive air of the Factory. This class is special for many reasons, for one, it is one of the few practicing art classes offered at BCB, where students are encouraged to break the mold of traditional intellectualism and begin to construct and illustrate their ideas through physical means. It is also a free space for students to learn, try risky methods, and expand their definitions of art and creation, all with John’s encouragement and guidance. Yet, perhaps what is most interesting about this class is its relationship to the Factory. The idea of site-specific sculpture is a common one. An artist designs her sculpture to fit the environment it will be displayed in, specifically playing with the setting to create the desired effect. After spending some time observing this class, I would propose that, much in the same reign as site-specific sculpture, this is a site-specific class. The Factory grants students a precise freedom, one that is important to artists often confined to classrooms: the freedom to create in a location devoid of intimidation. The Factory is large and cavernous; students get privacy whilst working on their projects and enjoy studio space in a capacity usually reserved only for professional artists. Furthermore, to any common eye, the Factory might leave something to be desired. The walls are in varied states of disarray; the structure itself seems to be crumbling. Yet, this is all to the benefit of the sculpture students. Drilling techniques are directly demonstrated into the walls, students can paint their exhibition spaces as they wish, and examples of uses of cement are demonstrated in attempts to level out window ledges. Overall, because the factory is not a pristine space, and perhaps is the perfect opposite of a lecture hall, students are given a bigger degree of freedom. There is no pressure to be perfect. The only pressure is one to experiment, to try new things, to use the space for all that it is worth, to be grand and daring when given the opportunity to do so. From my short time with the sculpture class, I would say that the students rise to the challenge. Many students are first time artists, but none of them were afraid to create daring and evocative pieces. In fact, most students were eager to tell me about their projects as well. I soon found that the best way to observe the class was to sit at the tables with other students as they work, and see what emerges organically. Needless to say, I am a lucky writer—the students were excited to tell me not only about their work and processes for creation, but their inspiration as well, often personal and important moments or ideas in their lives that they were beginning to translate and process through sculpture. On my third day, I walk into a student making a peanut butter portrait of Heidegger. His explanation was brilliant, his medium, although exciting a chuckle from me, is fearless. As I continue my walk through the studio spaces I stumble into discussions about full body casting, brand recognition, the value of sculpture without sight, the ethical uses of music, the relationship between grief and memory; within the maze like walls of the Factory, avenues for creative experimentation seem endless. And without the combination of the space and John’s never ending enthusiasm for the new, the weird, the innovative, I doubt the students would feel able to stretch the conventional understanding of sculpture to such magnificent lengths. John Von Bergen’s enthusiasm is contagious, and his support crucial. He was always willing to help any student with the formation of their ideas, and physical development of the project. After observing the class for the first time, I asked him if the class was structured around art history and theory or practice, he replied, “We are artists.” Truthfully, this simple sentence may sum up the class. The students are treated like artists, given freedom to make their own decisions, not only about artistic execution, but also about their personal artist statements, and the set up of shows themselves. Art history is important, and not left out, but in the end, this class acts as an avenue for students to discover their own abilities. The elevation from student to artist, to maker, to contemporary becomes evident in the way the students view their own processes as well. They are trusted with their own vision, and given the tools and guidance to make it happen, but never the advice to turn it down, or make it easier. Students are encouraged to work with any medium that speaks to their ideas, be it crepe paper, branding irons, duct tape or peanut butter. 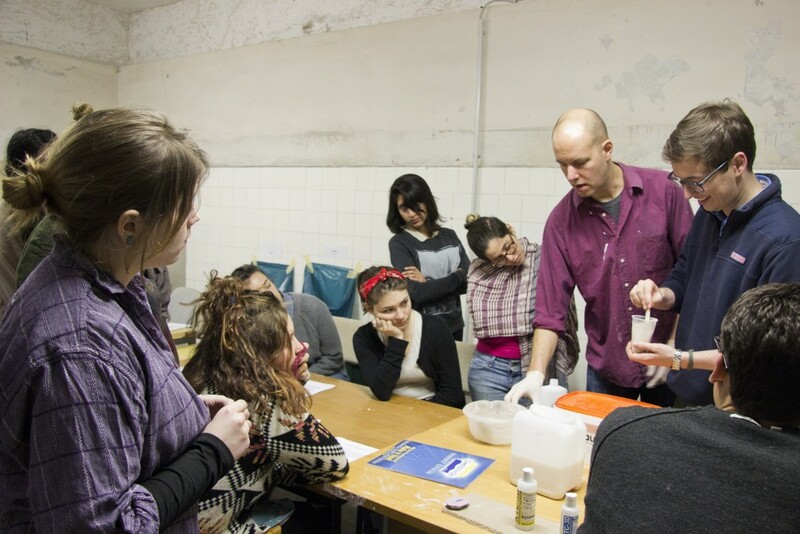 Overall, Contemporary Materials and Techniques is an incredibly important class for BCB. It gives students the opportunity to realize their potential outside of the classroom; it supports and encourages innovative expression in new ways. And perhaps most importantly, it allows every student to speak openly and loudly, with something more than words.